Folks have been kind enough to offer their thoughts and ideas related to columns I’ve written. I wanted to share some that have been sent my way. 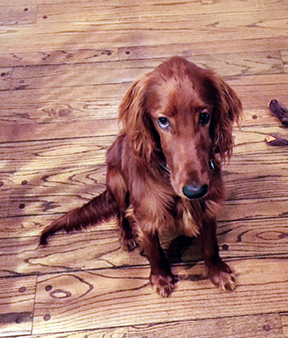 •Many were interested in Casey, the donut and cardboard-eating Irish setter. Asheville is a dog town, so it’s not surprising. Some were concerned that eating cardboard might harm him. I did call a vet and was told to keep a watchful eye, but that he should be fine. That prognosis wasn’t unexpected — Casey has a cement stomach and could chow down on nuclear waste, then come back for a second helping. Several people mentioned similar experiences. Jane told me her little Shih Tzu consumed six croissants, all of the string and half of the box before bedding down for the night. Another reader, Sandy, suggested that Casey must be a Yankee dog because he ate Dunkin Donuts. Down here in the South, she explained, dogs only eat Krispy Kremes. See, I learn something new every day. A couple of perceptive people suggested that I probably ate all the donuts myself, hid the empty box and blamed the dog. I laughed out loud. They’ve got my number. I’m not above stooping to those levels, just not that particular day. •In another column, I told the story of my wife suffering 40-50 yellow jacket stings, leaving her on the edge of anaphylactic shock. Several people shared similar experiences, and almost everyone suggested she always carry an EpiPen (epinephrine self-injectable to counteract allergic reaction). One reader, Kathryn, spoke of being swarmed by yellow jackets, then attempting to drive to her doctor. She quickly realized she wasn’t going to make it, and managed to get to an acupuncturist’s office seconds before she collapsed. They managed to save her life. Her advice was to see an allergist because a single sting could now set off a cascading and potentially fatal reaction all over again. My wife went through a battery of tests to determine what she was allergic to. It turned out to be almost everything (including me, I think). She had a series of injections to build up her resistance, and believe it or not, the day of her final shot, she was stung on the wrist by a hornet. Her arm blew up, but this time to manageable levels. She took Benadryl, and applied ice. Her doctor suggested that Advil would help reduce the inflammation, and it did, very quickly. A bunch of readers wanted to join the party and sent in their personal favorites. I’m sharing several of them. Have a seat. That’s a hard one to top. •Finally, another look at my column about Jackie, the young man who escaped the streets of Oakland, then jump-started his life with his wife and young daughter in Asheville. I had coffee with him last week. He just celebrated his eighth wedding anniversary. His eyes fill when talking about his family, and the joy of living in this community. He’s an entrepreneur, building an already successful business, and is still amazed at the good fortune of leaving Oakland behind. Pete, a reader, wrote that with so much negativity in the world today, Jackie’s story of success was inspirational. And as readers share, I get to hear their laughter as well as witness an occasional tiny miracle. Ted Alexander lives in Asheville. His second novel, “After & Before,” will be released Sept. 14. He will be reading from the book and signing copies at 3 p.m. Sept. 27 at Malaprop’s Bookstore/Cafe, 55 Haywood St., Asheville. Everyone is welcome to attend. His first novel, “The Fall of Summer,” a 1960s coming-of-age story, is now on sale at Malaprop’s Bookstore/Cafe and other online and local retailers. His second novel, “After & Before,” will be released this summer.